A high summer jam with a couple of variations……..
Apart from the odd overcast afternoon with an accompanying shower of rain, it’s been pretty dry here the past few weeks in Norfolk, and while it’s a bit too warm for me to want to spend too long outside in the garden, our raspberries are loving the early heat wave. Many of the plants are already my height and more and we’ve been picking fruit everyday, in fact there is now so much all ripened together that today I’ll be making jam. 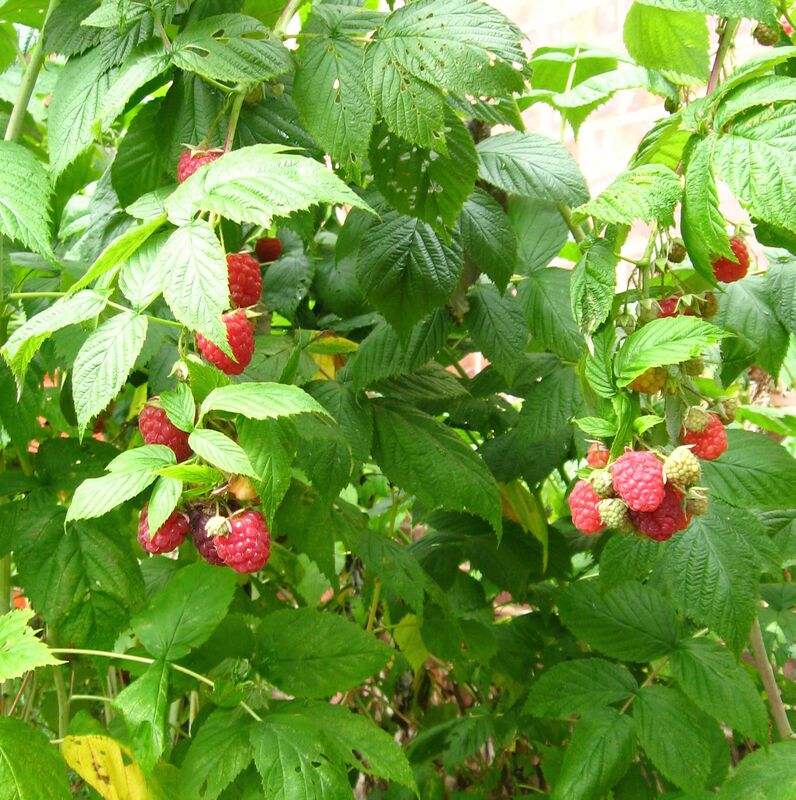 The variety of raspberry we grow is called Autumn Bliss, the plants produce two harvests, a small early crop around now and then they really go for it around August and will produce fruit, weather permitting, through October and even into November if there isn’t a frost. Those first fruits are smaller in size but come August they are the size of small plums, but already we are seeing very impressive sized red velvety berries, hanging down from the bushes like Christmas tree baubles….Normally we don’t get jam quantity sized gluts until the second harvest, so this is a lovely surprise, especially as today seems a bit cooler and I won’t need to keep fanning myself while I’m leaning over the jam pan. Don’t wash the raspberries, just check them over and cut off any bits that are a bit scabby. Put them into the pan you’re using for jam. Cover with the sugar and the lemon juice. Bring the fruit to a gradual boil, all the time just very gently stirring the fruit and the sugar together without over squashing the raspberries. Keep stirring gently, and allow the fruit and sugar to bubble furiously….as well as watching the jam, you’ll need to keep an eye on the time. The jam needs between 5-8 minutes (a bit longer if you are using more fruit), skim if it’s needed (though to be honest I don’t always bother), check for a set on a chilled saucer from the freezer, allow the jam to cool down for a minute (turn the jam pan off so it doesn’t keep cooking)…once the jam wrinkles when you push your finger into it, pour into the sterilized jars and cover with waxed discs. That all sounds a bit pfaffy but it’s actually very easy and it uses up fruit which otherwise isn’t quite so nice to eat. Raspberry jam is such a taste of Summer jam and can’t be beat on scones mere seconds out of the oven, ones so warm they can just be pulled apart before being covered with jam and a smear or dollop of clotted cream, it’s also excellent for a Victoria sponge cake. But I’ve also used the raspberry jam before in making truffles, the sharp fruity taste mixes in perfectly with the chocolatey ganache. That’s one very expensive cat bed…… at least the pan had been all washed so he won’t be all jam sticky….. So while the jam pan is being used for other things (I can’t believe he’s really made himself a little bed in there…) at least I can make use of some of the crab apples and wildlings that I’ve picked from the hedgerows that seem to be really heaving this Autumn…..I made some apple vodka last year and wasn’t really sure how it was going to turn out taste wise, however it was a more than pleasant surprise…..I left the apples slowly drowning in a big Kilner jar of vodka for about 6 months…then had a taste and another taste…hic….. it was more than a little reminiscent of a warm apple brandy or a Calvados….and when I offered tastes to friends no-one guessed it was vodka. It looked like it was going to rain an hour or so ago so I quickly nipped out to fill a basket with apples, beautiful yellow and orange apples the size of ping pong balls, all flushed and rosy with a real transulent glow about them…and then a selection of sharp green apples. Both work well in the flavoured vodka, and it’s really just a matter of giving them a clean, chopping them up and covering them in sugar and vodka and leaving them……. very welcome on a cold February evening when the wind is wild and it’s cold and dark outside…..
(I also got to see my little friend Bertie…he’s an adorable King Charles Spaniel with tufty russety orange eyebrows…he’s a real sweety and I was more than happy to sit on the grass and have a few minutes fussing with him while I chatted away with his owner about the joys of foraging and what I was going to be making)…..
2 cloves, piece of cinamon, star anise*……. Wash and pat dry the apples…..chop into quarters, discard any stalk but you can leave in the core. Pour over the vodka and seal the jar. Give everything a gentle shake. Put in a dark cupboard and gently shake the jar every few days (this helps dissolve the sugar)….Leave for a few months before tasting….if you’d like a more developed flavour just leave well alone for another couple of months…… finally remove the apples and spices. You can simmer the vodka drowned fruit and use them as a base for fruit fools (beware…they’ll be quite tipsy tasting) or apple tarts. Don’t trust that cute little face….. as I mentioned the other day we’ve been getting a new little visitor in the garden of late…..this is Ivy and she lives next door. She’s about 9 months or so I think and is one mischievious little minx. We occasionally see her brother Neil but I don’t think him and Bernard get on so well however this young madam seems to becoming Bernards new partner in crime*. Whereas Bob used to follow Bernard right through the house as they’d come bolting in from the garden, often all the way up the stairs and then back down again, Ivy tends to just come up to the kitchen door if she sees us about……however, if she thinks we’re not around it’s quite another matter and then she seems more than happy to come in and have a good explore and has made me jump as she suddenly appears from behind a chair or the side of the sofa…..when it’s been hot and we’ve had the door open she’s snuck in and pulled about in my work room (reels of sewing thread seems to delight every cat I’ve ever met) and I’m trying to forget what she did to my knitting….. I quite like sitting out in the garden on the door step with a cup of tea or with my breakfast, enjoying the peace and tranquility while the day starts to wake or just to have a few minutes breather while waiting for the kettle to boil….however I’ve found that leaving things mid eat on the back step to answer the front door is fatal….I’ve come back to find her face in my yoghurt and have even caught her wolfing down carrot soup…..
And she’s so quite quiet…Bernard wears a collar which has a bell and a name tag and a magnet for the cat flap…he gets grumpy about a lot of things but is as good as gold with having the collar on and it doesn’t seem to bother him….we get lot of birds in the garden and I feel that a bell gives them at least a few seconds warning if he’s lurking around in the undergrowth…but Ivy doesn’t so will silently creep up and spring out, often grabbing poor old Bernard’s tail in the process. I’m particularly fond of Bernard’s tail, it’s fat and fluffy and when he saunters off with it held up high it looks all the world like a peacock plume on a fancy hat and incredily stately and grand…. (when I commissioned a picture by my friend Beth, she drew Bernard using it to do the housework with…) and it would appear to be an object of fascination with other cats….Bob and Izzy and the rest of the kittens who lived next door last year were all “worm tails” as are Ivy and Neil. Bob used to spend ages staring at Bernard’s tail and feathery ruff, gently reaching out to pat them and gazing up with envy…Ivy is a bit more grabby grabby and a couple of times has almost fell off the potting table as she stretches out her paws to take a swipe at that enticing tail. 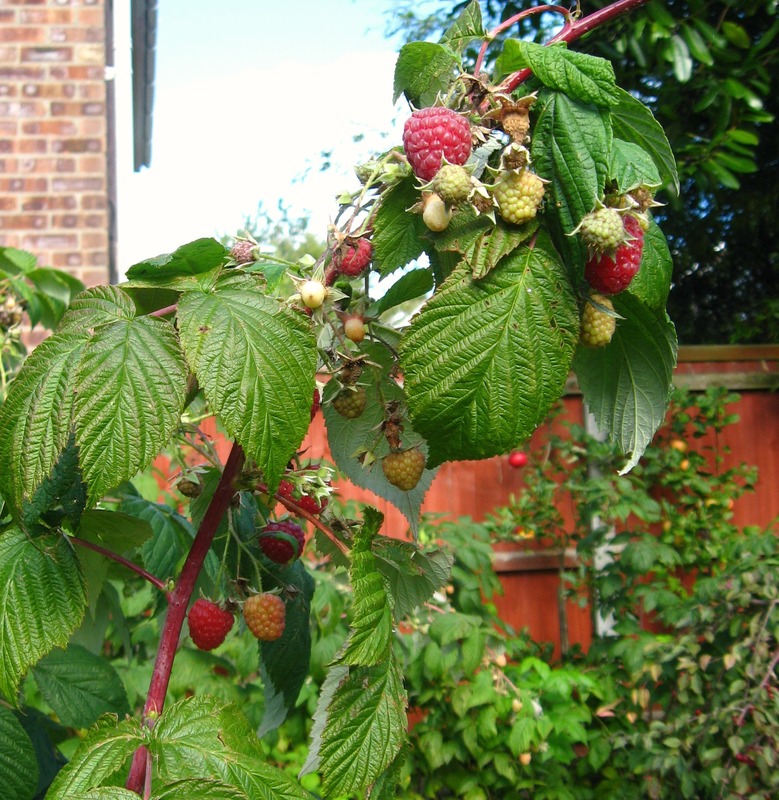 Otherwise in the garden it’s all been a bit quiet although the raspberries seem to now be coming into their stride….a handful of canes has slowly spread across the garden and we’ve now got quite a decent sized patch. The variety we like is called Autumn Bliss and we’re often still picking them late October early November…in fact one year I was picking them after a snowfall. They get really high and some of them out there are easily 7ft. They first start to fruit around mid-Summer but this first crop is never much to write home about, a few scrabby berries to scatter on breakfast yoghurt or pop on top of an Eaton mess, however the second harvest begins around now and is worth the wait…fat, velvety, rich tasting and full of flavour, the berries also swell up and can become the size of small plums in the blink of an eye…..we generally get a good few kilos of fruit and have enough to make and put down several batches of a French style jam for the pantry and Christmas gifts, as well as stuffing ourselves silly on raspberries and cream for pudding. Last year we made a raspberry liquor which was very nice and also a cognac jam inspired by Anna Karenina and Kitty’s jam. If you’re a long time reader then you know there is one creature that can make me shoot across a room and up on to the sofa pretty damn quickly…spiders…. lifting up these berries to find this fat monster did give me a bit of a start, however maybe knitting with natural shades of yarn has rubbed off a bit as I found myself gazing at those soft nut browns and the patterns on it’s body and actually rather appreciating the beauty of this hairy beast. * I used to think of Bernard and Bob as kitty versions of Butch Cassidy and The Sundance Kid…..
There’s been a big improvement in the weather this week and it finally feels warm enough for an ice-creamy type pudding…..one of the easiest chilled puddings we like to eat in the Summer is a semi-fredo, especially when we flavour it with fruit from the garden….sadly it’s still a bit early for our raspberries but a poke about in the back of our freezer has found a little tub of a cherry compote that I made last year with some foraged cherries….. In the past I’ve used the cherry compote to make a very grown up tasting cherry ripple ice-cream (served with a trickle of dark chocolate sauce…. but I think crisp buttery biscuits would have been nice as well. Along with the cherry compote I also found a little tub with a gooseberry and elderflower compote inside and I’m wondering whether to try that in more of a possety pudding for mid-week. The elderflowers have been a bit slow here this year but I noticed quite a lot of cloudy white billows out yesterday so I guess the week of sun-shine has helped them come on…..fingers crossed if it’s nice tomorrow we’ll head out with a basket and walking stick (helps me reach some of those higher up blossom heads)…. Semi Freddo is really easy to make, however this recipe does use raw eggs so it’s not suitable for children or anyone pregnant..
We buy all our eggs from Folland’s Organics on Norwich market, the eggs there are amazing and well worth the money, if you keep chickens or ducks yourself then your pudding is going to taste out of this world….I’ve wrote my recipe on here before, but this is a scaled down version if you don’t have a whole lot of freezer room. Line the two loaf tins with clingfilm. Beat the egg yolks and the sugar together until they become airy and pale in colour. Whisk the egg whites with a pinch of salt until they form stiff peaks. Whisk the cream until it just forms a soft cloud. Carefully add half the whipped egg whites and whipped cream into the egg yolks and sugar….and once that has only just come together, gently mix in the remaining half along with the flavouring…( I prefer to put in my flavouring now whether it’s a fruit compote, a couple of big spoons of very sharp lemon curd, a dollop of caramel syrup…….adding it now means the semi-freddo is lovely and rippled)…..sometimes I just use a vanilla bean if I’m serving the semi-freddo with fruit, and then I’ll scrape the tiny seeds out and add them to the egg yolks as I beat them with the sugar. Gently spoon out the mixture and divide it between the loaf tins, tuck all the clingfilm over the mixture and allow it a few hours to freeze. I tend to make it in the morning so it has all day in there. You can take it out of the freezer about 15 minutes before you want to eat it, just leave it out on the side, but I prefer to take it out an hour before hand and then leave it on a shelf in the fridge….turn the loaf tins upside down and it should slide out fine….cut and serve with a drizzle of any remaining compote and some crisp biscuits or fruit. Kittens, cavalo nero, the calmness of bread making and needing something “purely medicinal” at 10.30 in the morning…..
Is it wrong to confess to wanting something of a “purely medicinal” nature at 10.30 on a Sunday morning….Pretty Izzy from next door had kittens in the Summer and they’ve just discovered (while watching their Uncle Bob) how to climb up over our fence and creep into our garden. What’s black, cute and has twelve legs? The three extremely adorably fluffy kittens I found playing in my kitchen on Wednesday morning. 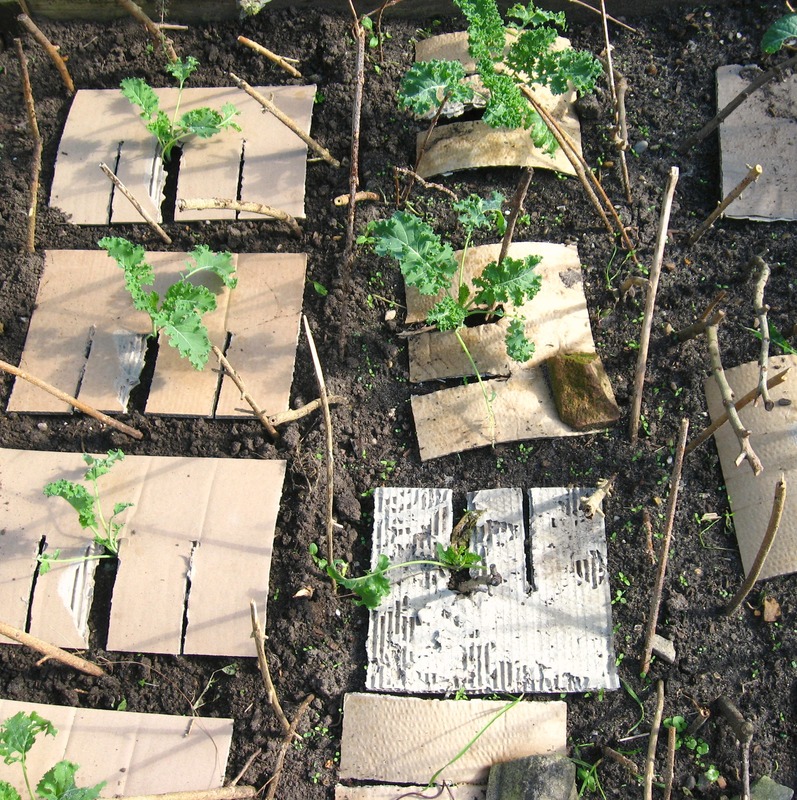 The carefully planted beds of kale and cavalo nero must smell intoxicating, like catnip or something as they won’t leave the beds alone…even putting in lots of pea sticks to stop them from digging hasn’t really deterred them…so next stage is fleece or netting. 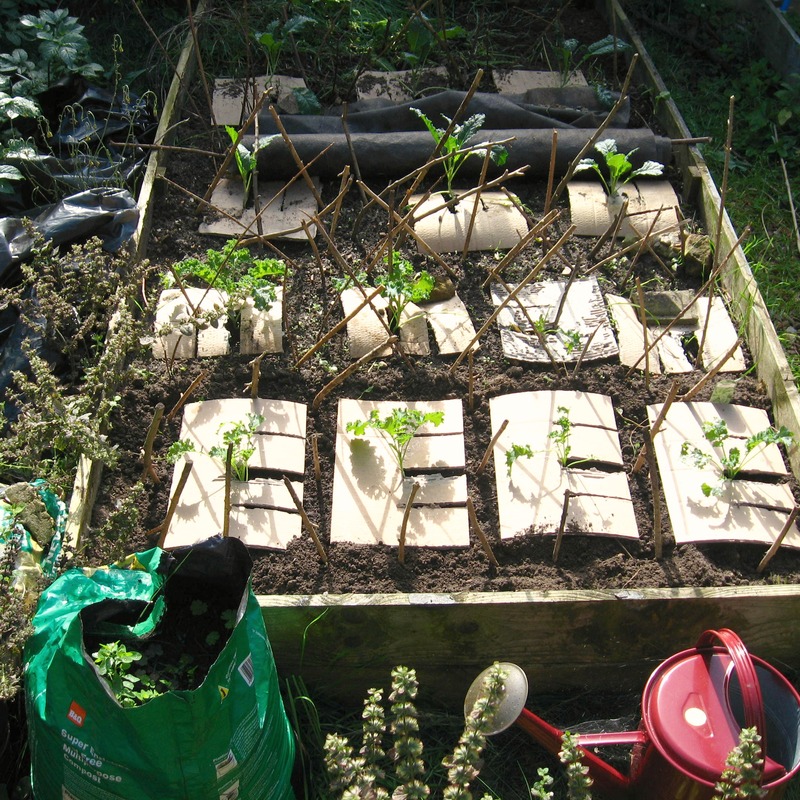 I’d like to take credit for the neat planting but it’s all my boyfriends work, including placing pieces of card around each plant to help keep down the slug damage and also it offers a little protection with the digging by kittens. We’ve got a bit of a tangley garden, a little overgrown in parts which the kittens are finding to be the greatest lark to play in…yesterday I spent most of the morning chasing them round pots (which got overturned), retrieving them from my blueberry bushes (which they were trying to nibble) and down from from the big tree in the corner…at one point my boyfriend had to climb up it to rescue a mewling kitty (which 5 minutes later climbed back up and then showed us it didn’t need any help thank you as it jumped on a neighbour’s fence and daintily walked across it. The high jinks this morning started quite early, this involved getting into what I call our “poly-tunnel” while another jumped on top and was causing the roof to sink down….the best fun ever if you’re a cute, big eyed kitten….and a bit annoying if you’ve spent the previous afternoon planting and building it. One even half wiggled into the big Mister McGregor watering can, his little bottom peeking out. Nothing is safe…even the raspberry plants are getting a chew (here they take after their Uncle Bob as he liked to do that do when he he first discovered our garden in the Spring). Luckily the tomatoes seem to have survived the kitten capers….the lovely sunshiny weather of the last week has seen lots of what I thought were destined for chutney, green tomatoes, instead ripen up and were eaten yesterday in a big salad (they were nice and sharp, intensely tomatoey and very good with a little goat’s cheese)…..there’s still quite a lot of tomatoes so any that don’t redden in the last of the Autumn sunshine will no doubt be thrown into a pot of slowly cooking chutney in a couple of weeks time. We’re still picking the Autumn Bliss raspberries (a fruit that more than lives up to it’s name)….I just made a couple of batches of raspberry jam this year including this lovely recipe… I tinkered a little with the recipe and think if you’re going to make it then you’re better off using raspberries that have only just turned red…the heat breaks them down so quickly that unless they’re still quite firm they won’t stay whole…..a nice jam to make if you grow your own…and obviously perfect for eating while reading Russian novels. You could of course just add a splash of cognac to this recipe as it’s very similar. Along with the jam we’ve also made this raspberry liqueur but substituted Marsala for the red wine…the recipe says that afterwards the raspberries can be used for something else, however we found really all you’re left with is a pink seedy pulp so added it to some cream and sugar which I’d bought to a boil (for 3 minutes) and then left it to infuse…strained and poured into little ramekins and made fruity possets. I think lemon and orange ones are the best but these were still nice to have with fresh berries on top. 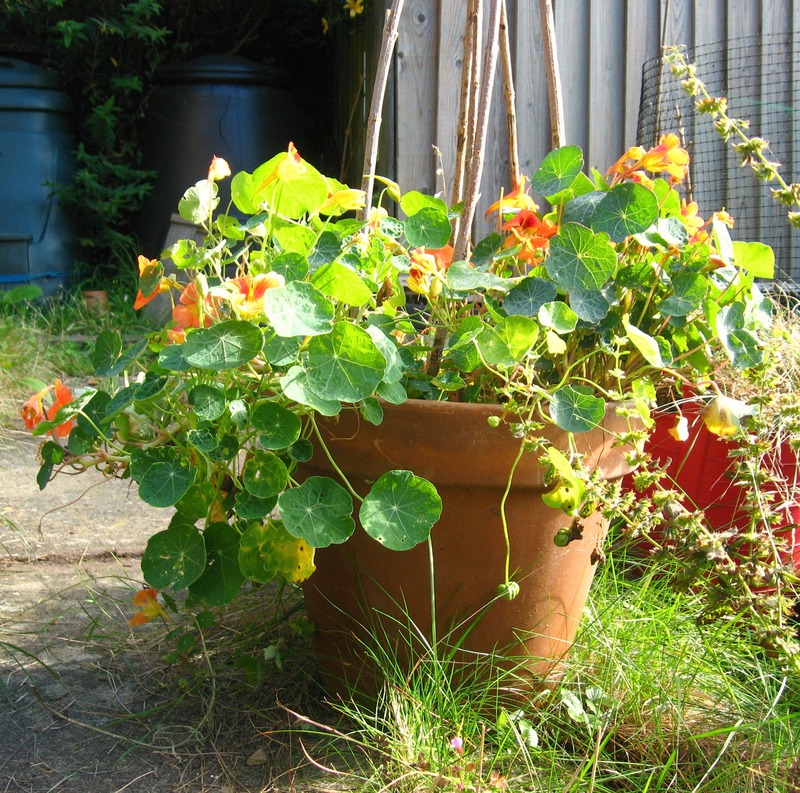 This pot of nasturtiums has been wonderful to look at, especially in the mornings before the day has brightened itself up. The flowers are nearly always full of bees and I have to tap them gently before picking them for salads (I love the velvety feel of the petal combined with that peppery taste). Thankfully the pot has survived the kittens running around (though there’s been a couple of close wobbles as they clamber up it only to jump down on top of one another) and earlier this morning I saw a little black face peeping out from all the greenery before darting off to join it’s brothers in adventures and mischief. After what feels like the umpteenth kitten removal (they’ve been all over the garage roof which is on a slope so they climb up and peek over the top), shooing them out of the kitchen (my fault for having the door open but it’s so warm today it’s nice to let in the fresh air and sunshine while the weather is good) and “hey you-ing” as they run out of the house with one of Bernard’s pompom toys in their mouths, I’m starting to eye the bottle of Pomona and I’m wondering if just a small glass, for “purely medicinal reasons of course”, might be just what I need to stop feeling quite so frazzled. And in the midst of the chaos that only comes from four little kittens causing havoc and mayhem, there’s the quiet and calm that is bread……allowing the sponge to slowly bubble away, the slightly sharp scent of the natural leaven mixed in with a grated apple and a dollop of honey, a handful of oats and bread flour. I though to make a loaf this week with cobnuts and apple (they work so well in a crumble how could they not work in a bread loaf) however I’ve now missed the fresh cob season…one of the lovely guys (always smiling whatever the weather, even when they have chilblains and wind chapped fingers) on Mike’s vegetable stall on Norwich Market (stalls 46 and 47, they’re right on the front) said the cobs they’d been offered now were all brown rather than green and you’d be better off buying hazelnuts so it’s a recipe I’ll put to one side for next year. 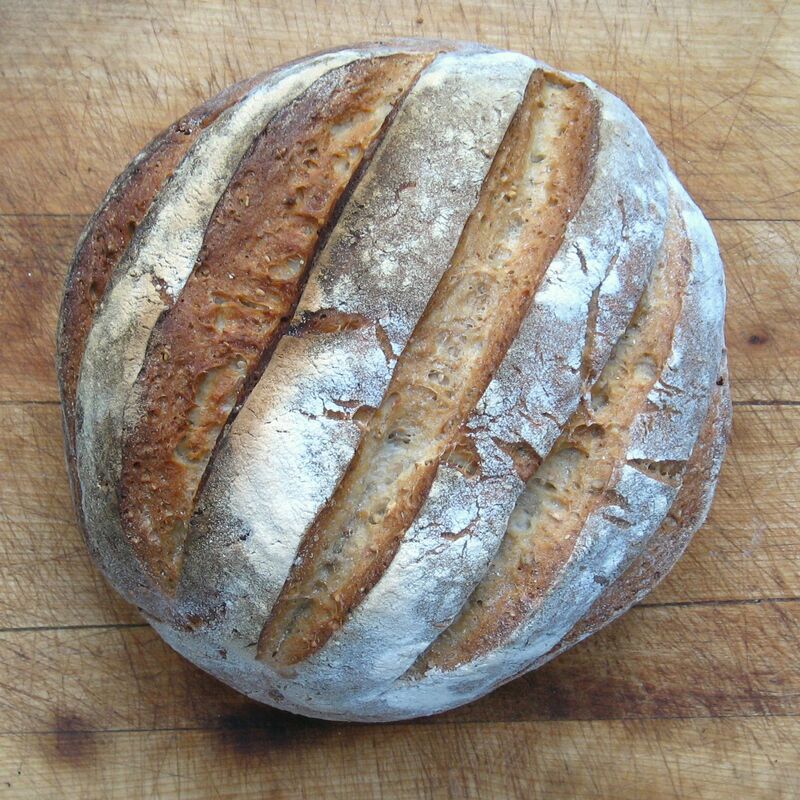 But if you’re lucky enough to have green cobs where you live then I’d thought to make a paste like this walnut one (though with cobnuts) and adding that to my regular sourdough recipe with apples. This one is a simple apple and oat loaf but I’m thinking to make a hazelnut bread with brandy soaked raisins…a bit like cinnamon rolls, not so sweet and a little more robust and rural, for next weeks breakfast. The cinnamon rolls always keep well and I think will raise a smile when one is found wrapped up in a lunch tin as the something sweet for elevenses. When it’s raining cats and dogs and picking raspberries by umbrella…. Well so much for a Summer heatwave, this week it’s been raining cats and dogs, every time the cat comes in the floor needs wiping over and I’ve been scurrying around the garden lifting water laden pots out of over flowing saucers. 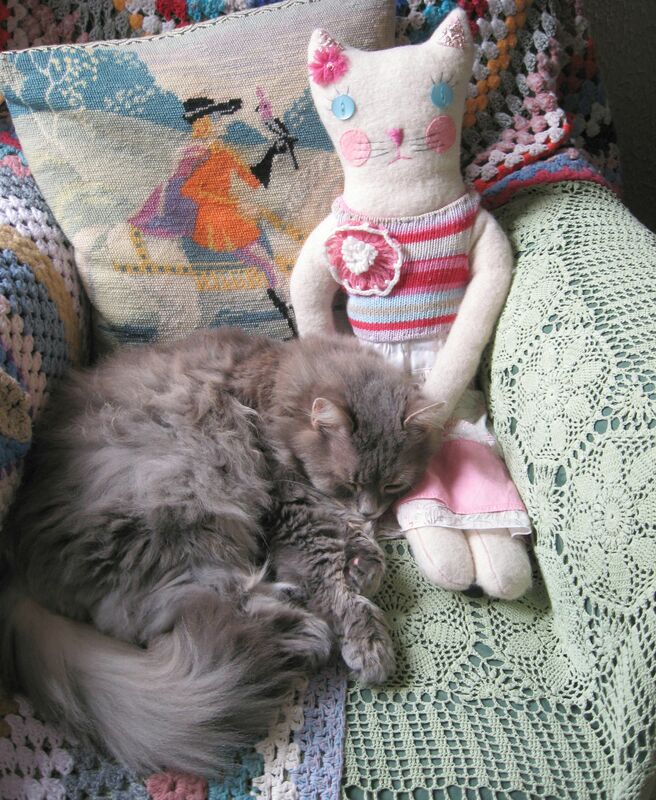 However at least someone isn’t too bothered by the weather, his current favourite spot is snuggled down on his Nanny chair, all curled up with Miss Enid…..soft snoring and gentle puttering and mutterings..interrupted by the occasional trumpety noise and the less than pleasant aroma that accompanies…. I’ve been trying to have a bit more of a sort out, in part because I was getting a bit cross I couldn’t find some of the the sewing threads that I’d bought recently (I’d put them in a safe place and then couldn’t find them…then only for them to magically appear right under my nose a day or two later…)..although I do most of my sewing by hand, a fair bit still gets done on a sewing machine..after the traumas of last week when my Bernina machine started playing up and needing to bring my beloved Dorothy out of her retirement, I found I was then feeling somewhat fraught trying to lay my hands on thread that I could use in the sewing machine. 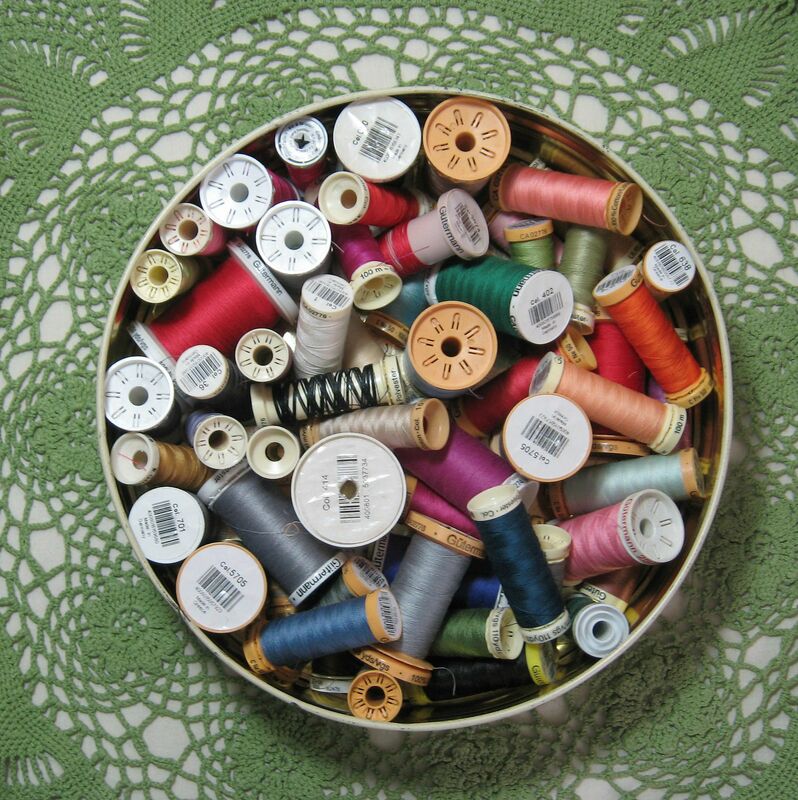 I ended up having a bit of an “aagghhh” moment then calmly, took a deep breath and just emptied a shocking amount of thread out on to my work table (and on the floor…) and began sorting out all the Gutterman thread I have. (I like to use Gutterman in my sewing machine, I find it doesn’t keep snapping like the cheap thread and the cotton comes in a good range of colours.) It’s quite nice having it all in one place, and I’m trying to be good and not put random threads back in odd places like the window-sill, or behind my computer or in one of the umpteen sewing boxes that seem to accumulate around my room. Every so often I like to clean out and tidy my current sewing box (it makes me feel like Amelie’s mum cleaning out her handbag or her dad tidying out his work box)…generally what’s in there changes depending on what I’m sewing, although there are always going to be a few old friends and favourites that I like to have close to hand that make my sewing so enjoyable but there are always a few “now how did that get in there”s that surprise…. Favourites emptied out include little red Clover wonder grips (left over from the hexagon piecing a few weeks back), a rel of vintage ribbon (had a present to wrap and tied it with this), beautiful Sajou embroidery scissors and vintage tortoise shell effect ones (presents from my boyfriend), numerous silk threads for hand sewing, beeswax (for making the silk thread stronger), elastic bands for the Bernina (a little trick for the 1008…the wheel on the side that turns the needle tends to stick which is a pain when you need to re-lease it when you want to thread up a bobbin…a fat elastic band placed around the ribbed edge of the wheel helps you get a nice tight grip and the wheel un-screws much easier), an assortment of thimbles (they breed as I don’t often wear one so I don’t know where they are coming from), more un-pickers than you’d think possible..(this is why I don’t sew a lot on a sewing machine, I always end up going too fast and then needing to un-pick what I’ve done.. one of them has a little brush on the end which is handy to regularly dust out under the stitch plate), red strawberry needle sharpener (bought some years ago from The Royal School of Needlework and these are very similar….they seem expensive but they are one of the little things in my sewing box I love more than words and it gets used no end)…..there’s also a pair of Japanese fabric snips (another gift from my Arpette) which are lovely to use, tweezers for stitches that don’t want to come out without a good wiggle, an old embroidery pamphlet and a knitting needle gauge because it has a nice size little ruler along the side. There’s also a pin cushion ball I bought form a car boot and which when gently and carefully kneaded, produced a shocking amount of needles. 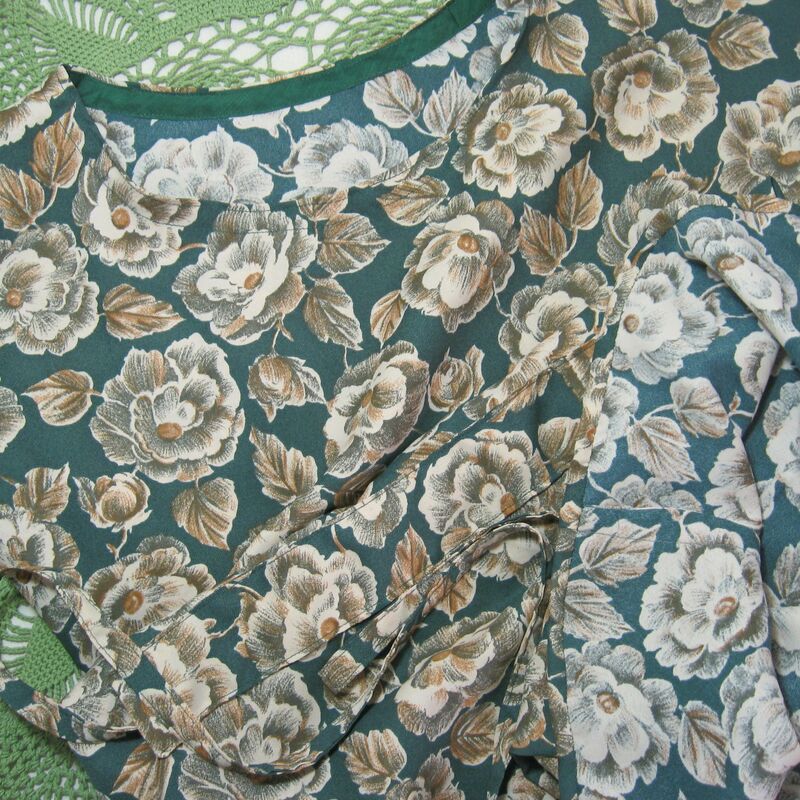 And this is one of the reasons there are so many un-pickers in the sewing box…..it’s one of the frocks I’ve been making based on the dottie angel dress pattern. The fabric is from one of the antique/junk shops in Norwich and actually…all the thread and trimmings are vintagey too……rather than make the tucks in the front, I’ve sewn a fabric band across the front. The ties are attached at the front, thread through and pull up at the back. I’ve also not bothered with the pockets, I htink the fabric is a bit light weight for them…It’s quite a slinky number and the fabric feels nice and silky….it was a bit of a “oooh…blast” to sew as it was slippy, so I ended up hand sewing the hem, turning it over a few times with the needle point and though this sounds a right old chore, I found this the easiest part of the dress. Modeled it last night in front of the boyfriend and the cat, and it didn’t get the “are you wearing curtains”comment so figure it’s safe to wear out of the house. 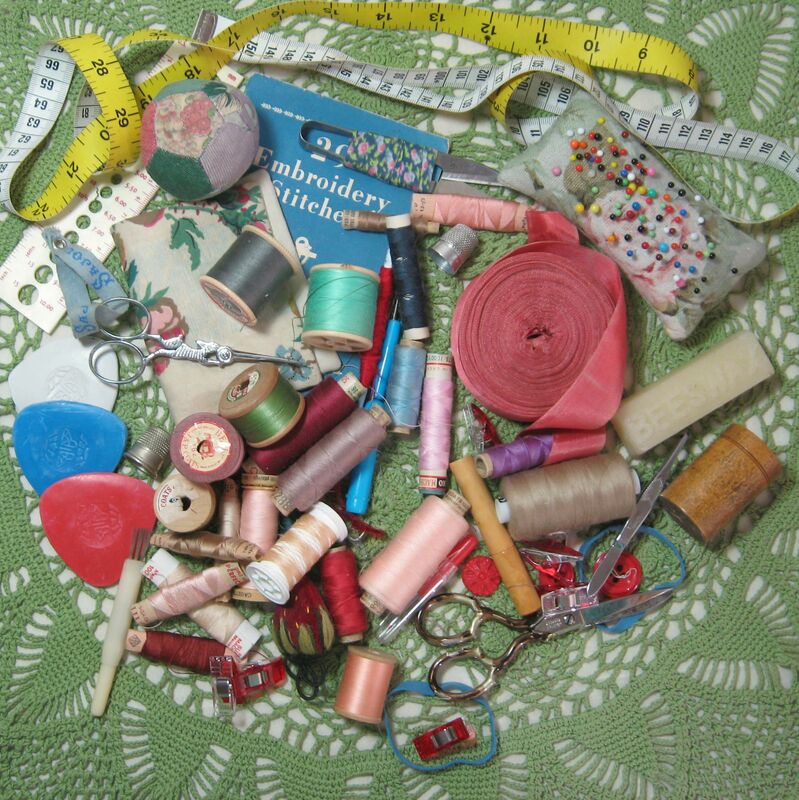 Looking at the picture I’m thinking my sewing does look proper ropey…all I can do is hang my head in shame and say I wasn’t any where near the sloe gin or fruit vodka from last week. It’s too wet to go foraging as the rain’s been so hard and I know the blackberries will be all mushed but hopefully if we get some sunshine I can get out over the weekend…in the mean time, we’ve got raspberries all ripe and ready to burst in the garden, so it’s out with a brolly and although a bit of balancing is required when there is both a bowl and a brolly in one hand, any trouble is well worth it, especially if there’s cream in the fridge. I never used to like raspberries growing up but then I had a warm one, freshly picked and it was a taste epiphany, they’ve become a favourite fruit, and the crop we get between now and October (sometimes even November if it’s mild and sunny) are looked forward to all year round……delicious in jams and syrups poured over ice-cream, I love them just as much eaten straight off the bush, and with the merest sprinkle of sugar and a dollop of thick cream they blow strawberries out of the water…velvety and soft in texture and with a rich, intense fruit taste, they seem so much more luxurious than what they are…..
Our raspberries are doing really well this year. We had quite a glut of them last year and I made raspberry jam, and I think the rate they are coming this year I’ll be making jam in the next day or so. 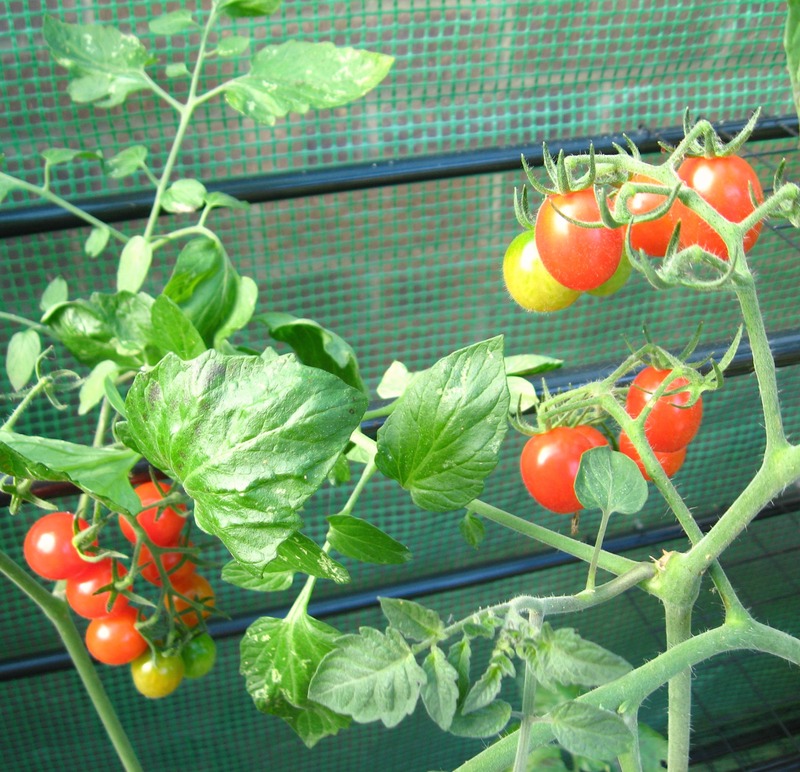 The variety we grow is called Autumn Bliss and they certainly live up to their name. 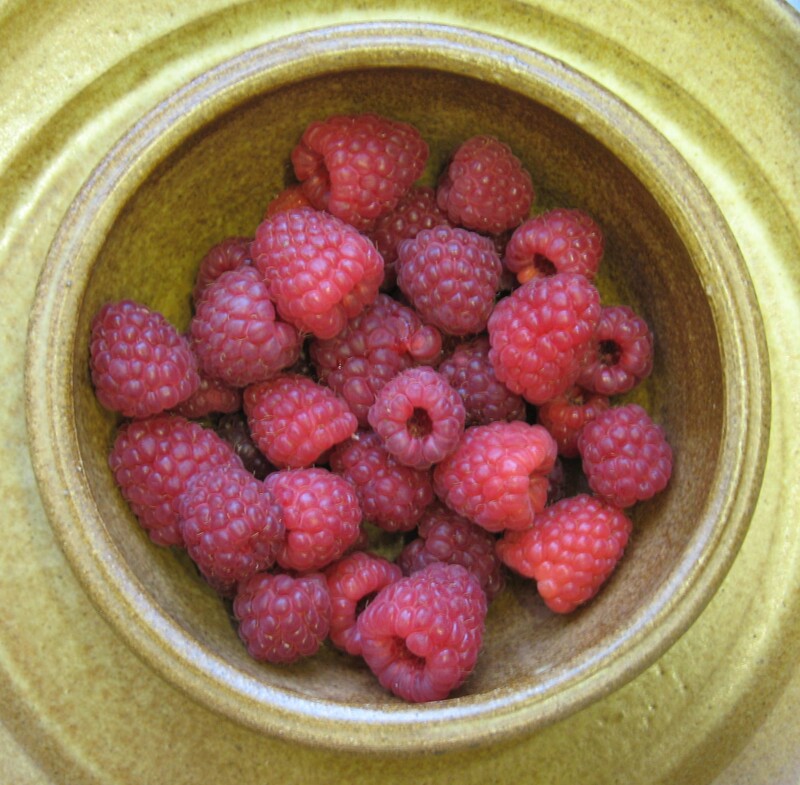 We were still eating freshly picked raspberries last October. They start coming at the start of August but the first fruits often are gnarly and I just put them straight in the compost (actually I just throw them on the ground under the raspberry plants) but come September the second season of berries become ripe, they’re huge ,and are just delicious. They melt on your tongue and are at once sharp and sweet. We have them with yoghurt or with meringue and cream. I’ve made Anne’s birthday cake with them on top before and that was a perfect combination. 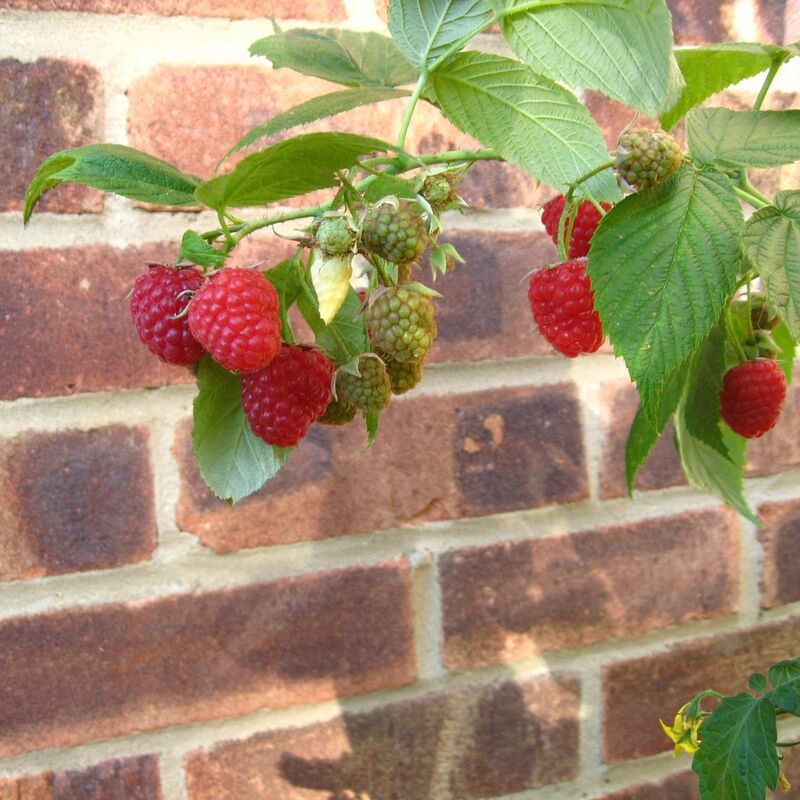 No raspberry from a shop has ever tasted as good as a home grown one (in fact for years I thought I didn’t like raspberries), they are really easy to grow and I would recommend giving them a try. Ours are about 6 years old now I think, we moved them from my old garden about 4 summers ago and they didn’t seem to mind the change of location. This year they’ve grown to about 7ft tall and are laden with fruit. They are no trouble to move and they sprout up like billy-o, so a small handful of canes quickly becomes a jungle. Dark woods and a wild wolf Karise….. Dark raspberry truffles inspired by fragrant yarn…. Kitten soft with a silky lustre….